Trial Lake (10,000 ft elevation) the snow water equivalent is higher than the lowest year on record (1992). 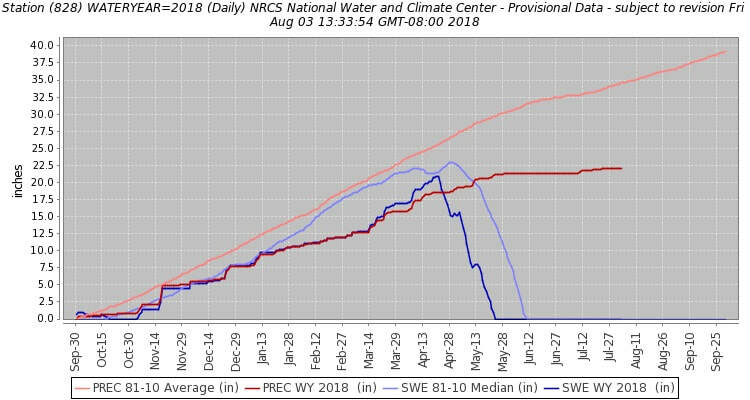 Beaver Divide (8,000 ft elevation) the snow water equivalent is very close to the lowest year on record. ​Also, Central Utah Water Conservancy District has compiled the full set of phytoplankton data from above each dam. This includes data from the early 80s. The difficulty in analyzing the data is that during the sampling period the phytoplankton counts have been calculated three different ways. There is hope that by later this year there will be some analysis done and reporting will be done at future watershed meetings. The Utah Department of Agriculture and Food works with farmers and ranchers through conservation planning and assistance designed to benefit the soil, water, air, plants, and animals that result in productive lands and healthy ecosystems. They also participate in numerous outreach events to educate and promote conservation. Dax discussed the various events and activities that he is involved in. Extell Development Company, the new owners of the portion of the Mayflower properties that is on the west side of US40, have entered into a Voluntary Cleanup Program with the State of Utah. An agreement was signed in July 2017 and DERR accepted a workplan from the developers on December 1, 2017. Field work to characterize the materials on the site was accomplished in December 2017 and February 2018. Once characterization of the site is complete the developer will make a proposal to DERR on how to cleanup the site. A management plan will also be developed to outline a long term strategy on how to monitor and maintain the site to protect the environment. Various developments around the Jordanelle Reservoir were discussed. The Jordanelle Parkway which connects the Mayflower Interchange area to the Browns Canyon Area is in planning stages. This parkway needs to be completed before more development occurs north of the Fire Station. The three separate parcels from the original Mayflower properties were discussed. The Mayflower North property is primarily residential. The parcel on the west side of US40 has been purchased by Extell who is working with Deer Valley to develop a ski resort and a resort village. The property near the State Park is being developed with mixed use, primarily single-family and multi-family. The Mayflower Tailings piles are being covered with topsoil and seeded to complete remediation of the site. For now no development is allowed on the tailing piles. Erin’s research has centered on harmful algal blooms in the rivers. Much study has been done on HABs in the lakes and reservoirs, but little has been done recently in the rivers themselves. Sampling for periphyton occurred in November 2014, February 2015, and May 2015 at five sites along the Provo River. Additionally, sampling occurred along other rivers and creeks in Utah including Red Butte Creek. Relative abundance of the various algae were identified and each sampling period at each site was standardized to 100%. The variability of the periphyton and phytoplankton at each site was discussed.